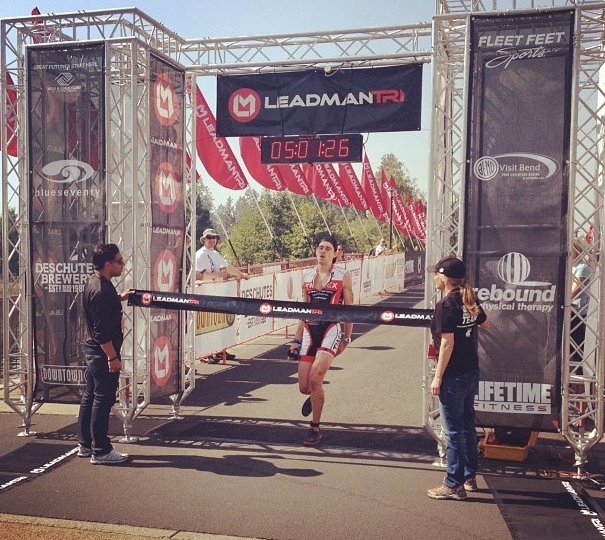 At the last minute, I registered for the Leadman 125 race in Bend, Oregon as a "redemption" race for my DNF (Did Not Finish!) at Half Ironman World Championships 2 weeks ago. So myself and my friend Derek Garcia drove down to beautiful Bend, and met up with an athlete who I coach (Jim McIntosh) to survey the bike course - which started up at about 5000 feet elevation at chilly Cultus Lake and ended with a screaming fast descent down into Bend, Oregon. 1) UCAN Superstarch - eat 2 servings for breakfast (mashed with a banana) and then one densely mixed bottle of UCAN (200 calories per hour) on the bike downtube and one Nathan running flask for the run (also mixed for about 200 calories per hour). 2) Energy28 Superfood - slam one just before the swim, and then one serving of it mixed in with each serving of UCAN - for both flavor and some extra energy boosting compounds, like Maca and Rhodiola (Energy28 also has about 35 calories a serving). 3) 5 Master Amino Pattern capsules per hour (to keep my blood amino acid levels up). Basically, with this 1-2-3 combo, I'm giving my body a slow release sugar with some amino acids in it, and deriving the remainder of my energy from my body's own fat stores - which basically means I'm eating 200 calories less per hour than I normally do during a race. You can really geek out on this nutrition protocol by clicking here, if you'd like. As I expected with a late season race in the Pacific Northwest, race morning was dark and cold. Our bus driver got lost on the way up to Cultus Lake, so I arrived at the transition area in just enough time to put my water bottle on my bike, use the porta-potty, and rush into the tent to put on my wetsuit. Unfortunately, I'd grabbed the wrong wetsuit from the stash of wetsuits in my garage (my BlueSeventy Helix was stolen at the Troika Triathlon), and I found myself feeling like I was being strangled in a tiny wetsuit with arms and legs that came up to my elbows and knees! But the water was cold enough to where I did not want to venture out without a wetsuit, so I wore it. Feeling like I was hyperventilating the whole time, I managed to get onto the feet of a faster swimmer and hold on for dear life for the 2.5K swim. He dropped me about 200m from the finish, but at that point I was simply relieved not to have A) frozen or B) ripped my wetsuit. I swam this swim the same way I approach my Half Ironman swims - no pacing or holding back. Just swim as hard as you can (without breaking form) from start to finish. As I came out of the water and ran into T2, struggling to emerge form my tiny wetsuit, I had no clue what place I was in, but knew that I was freaking cold! When I arrived to my bike, I saw that the bike beside me was already gone, which I hate to see. So I skipped the important step of putting on gloves, or arm warmers, or socks, and just took off. Thanks to my hasty transition out of transition, for the first 15 miles of the bike I watched my fingers slowly turn blue. I couldn't hold my water bottle or eat anything because my hands were so cold! I just kept opening and closing my fingers, hoping they'd warm up soon so I could eat and drink. By about the 15 mile mark, I had passed everyone on the bike and caught the leader, Jeff Smith. Since my legs were feeling good, I decided to put a move on him too, so I passed him, put the hammer down and didn't look back for the next 5 miles. I beat Jeff out of transition, but at that point, I was thoroughly parched, and wasn't sure I was going to be able to maintain the intensity I wanted for the 10 mile run. My strategy was to simply run this race just like a 10K, then hold on for dear life in the last 4 miles. But my lips and throat were completely bone dry, since I only had one bottle of water during the entire bike ride. Every time I went cycling through an aid station, they simply weren't ready with the water bottles. That's the hazard of leading the race! As I worried about my hydration, Jeff caught me quickly, and we reached a Y in the road after just 1 mile. It wasn't marked. One option was to run along the river and the other was to climb a steep 1/4 mile hill. I'm not sure why, but we both took off up the steep hill, and it wasn't until we got to the top of it that we realized we ran completely off course. It's a horrible sinking feeling when you're in the lead and you lost precious minutes running the wrong way, but once again, that's the hazard of being in front. So we took off back down the hill, and now Jeff was in front of me. For the next 4 miles, I tried to keep him in sight, and by mile 5, I saw him not run through an aid station, but actually briefly stop to drink water at the aid station, which (no offense Jeff) to mean is a sign of weakness in a run of this distance, and suggests that you might be hurting. I was hurting too, but that's the point where I put my head down and my move. I passed Jeff by the end of that aid station, and didn't look back for the next 2 miles. At mile 7, I glanced back and didn't see anyone. But not wanting to take any chances, and knowing that the 34 and older age division started 6 minutes behind us, so someone could actually still beat me, I kept the throttle down all the way to the finish line, and ended up winning the overall race title by a little under 3 minutes. So despite barely making the swim start, wearing a tiny wetsuit, and getting lost on the run, I managed to squeak out the overall win for Leadman 125! The best part is that with that different nutrition protocol, my gut felt fine after the race (none of the usual bad gas, post race sugar burps, caffeine downers, or anything like that!). Leave your questions, comments or feedback below. Awesome reminder that one can still have a great race with many things not quite going according to plan! Awesome! Congrats!! You have confidence in yourself that is why you have done it . . Self confidence is the thing which make you big and better .. 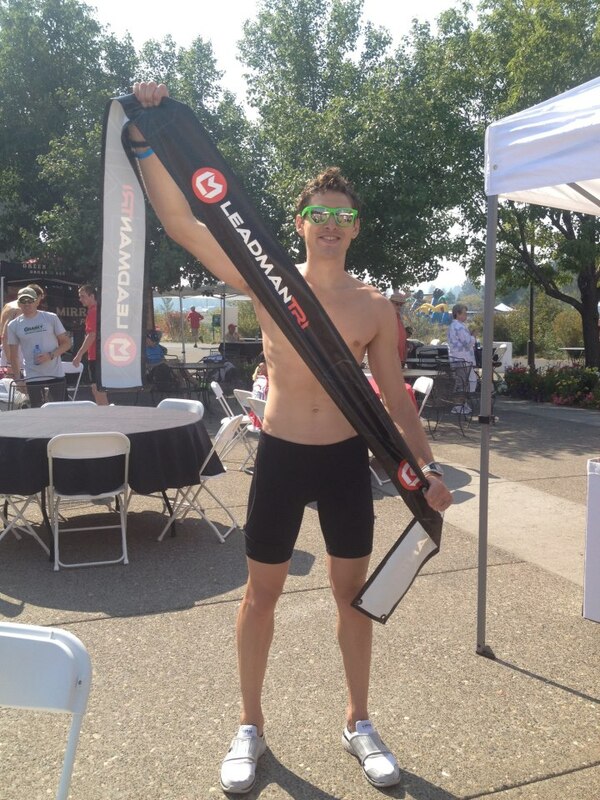 Thanks for Triathlon Tips you have given . .
Get Twitter Tips From Ben on Twitter! Personal trainer, exercise physiologist, nutritionist, occasionally poses naked on stage. Ben Greenfield is the Get-Fit Guy! Ben Greenfield is a triathlon coach, click here for more info. Get Ben Greenfield Triathlon Adventures as a Hardcover Book!